This oldie-but-goodie recipe has become an easy favorite for many, and has remained a go-to in our house as well! Make this as a "meal prep" for dishes throughout the week, or get a simple weeknight dinner started before you leave for work. 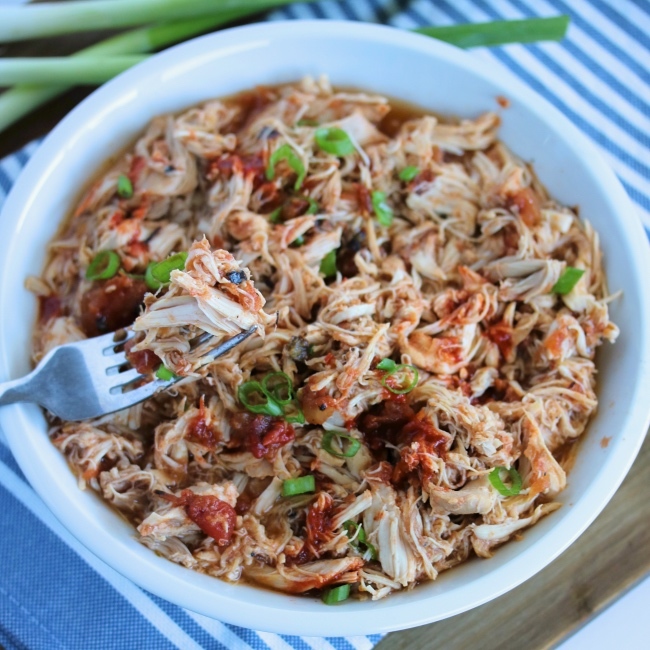 Works in the slow cooker OR Instant Pot! Life has been crazy lately... but isn't it always? I have been studying intensely for the comprehensive exam my graduate program requires students to pass in order to officially get their Master's degree (not fun). So, needless to say, I have been pretty short on time & energy. I love waking up and cooking breakfast, but by the time dinner rolls around-- it's another story. I decided to make a big batch of this chicken at the beginning of the week, and have been looking forward to eating it with every meal. I have actually had to stop myself from eating it for breakfast... that good. The best part about it? The crockpot cooks it for you! I drop in the ingredients (you really only need two), mix it up, and let it cook. Voila! 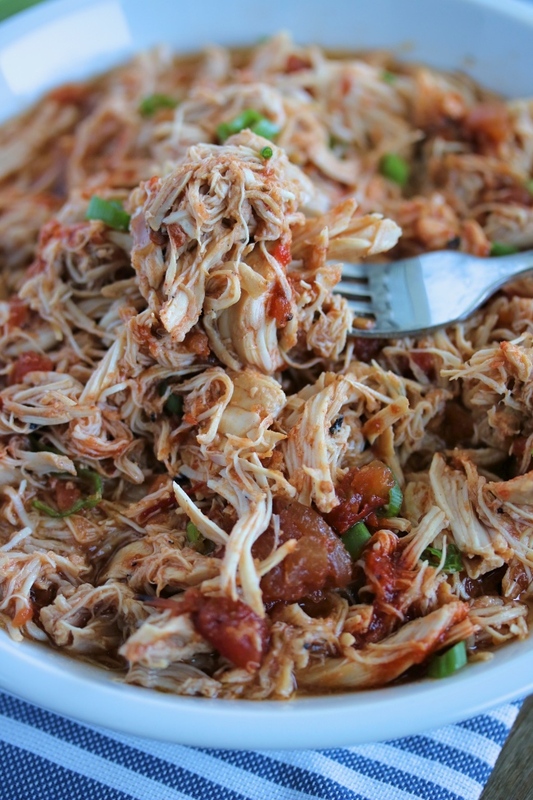 Perfectly cooked chicken that's ready to go for soups, salads, lettuce wraps, burrito bowls... you name it. I even ate it straight from the bowl the first night I made it. I used a combination of chicken breasts and thighs to switch things up, but you could stick with one if you prefer. The thighs give it great flavor though! When choosing your salsa, look for one with no added sugar. I like the big jar of the 365 brand from Whole Foods~ good ingredients & inexpensive. Trader Joe's has a good "chipotle" flavored one too with no added sugars. You have to try this out... 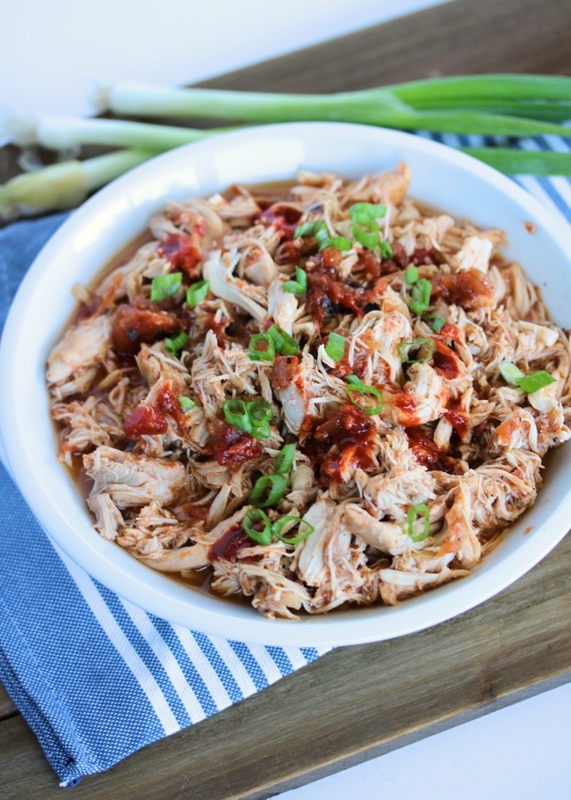 It's so embarrassingly easy, & takes the "boring" right out of chicken! Add half of the salsa to the bottom of a slow cooker. 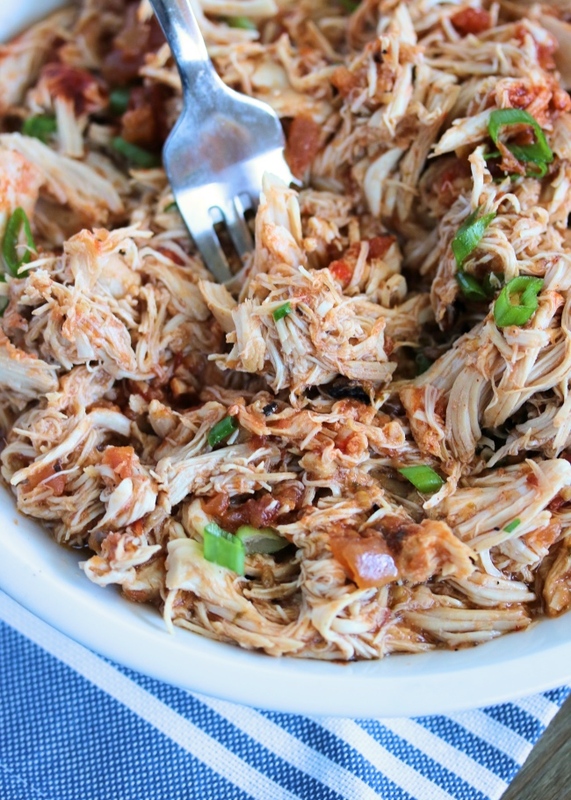 Arrange the chicken in an even layer over the salsa. Top with the remaining half jar of salsa (an any additions you'd like to add). Cook on high for 4-5 hours or low for 6-8 hours. Use two forks to shred the chicken in its juices. Serve hot! 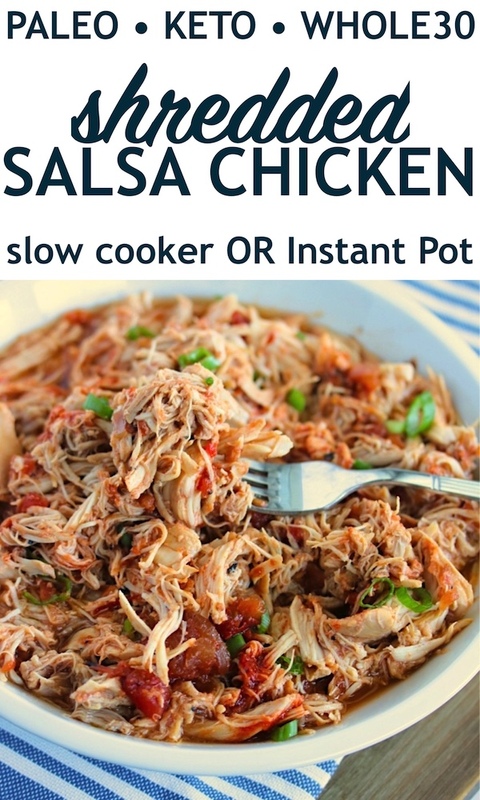 Add the chicken to the Instant Pot and top with the salsa. Stir to coat. Place the lid on the Instant Pot and set to "sealing". Use two forks to shred the chicken in its juices. Serve! Store leftovers in the fridge, in an airtight container. For our favorite "burrito bowl", serve the chicken hot over white or cauliflower rice, shredded lettuce, or fajita veggies. Top with jalapeños, avocado or guacamole, and a little extra salsa. For Whole30, double check your jarred salsa for added sugar. Know that there are options out there at Costco, Trader Joe's, & Whole Foods! Made this recently and LOVE it! The options are endless and it is quick and healthy! This looks delicious! I definitely need to try it. I'm a fan of anything that includes a crock pot! Jessie - Like your blog. 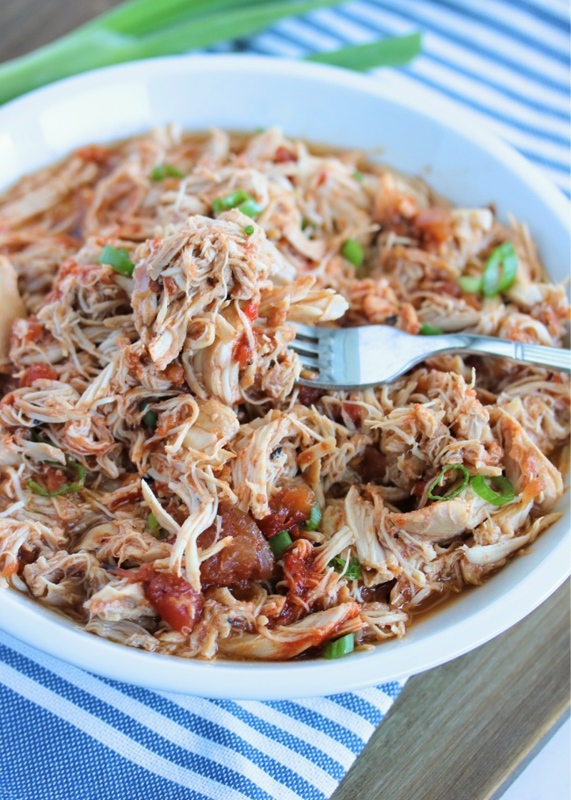 Made this recipe using antibiotic free chicken thighs and my wife and sons both love it. I laugh at how easy it is to make. Its great to have the makings of a meal in the fridge all week to pick on and avoid the temptation to eat out. Hi Mark! Way too easy, right!? :) Thank you for the feedback, and glad to hear you're enjoying my blog! Hey love I'm making this tonight, If I make it for the week, how many days can I use it? Thank you! Xoxo! Hey there - how many servings is this about? My husband and I loved this recipe, thank you!! We through some roasted bell peppers in with it, so good! I can not wait to try this! You mentioned that you posted this on Instagram doing Paleo-style "burrito bowl". Where can I find it on your page? I print out recipes and put them in a binder for when I go to the store I have the recipe with me. :) Thank you! I was wondering how you shredded it. Seems like a vitamin rich meal. Have you tried this in your IP?